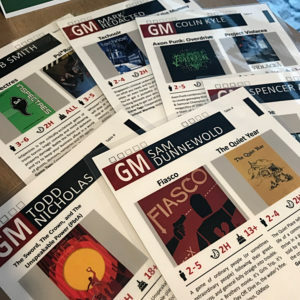 Thanks to all of you who joined as a volunteer or a player at the Gen Con 2018 Games on Demand! Despite our change in location to the Hyatt’s third floor, we managed to fill just about every game we had and put smiles on a lot of faces. If you’d like to give us your feedback about your experience with Games on Demand, we invite you to fill out our feedback survey! Running this event has some costs, so if you had a good time at the show, consider throwing us a donation for supplies! If you’re interested in volunteering with us at a future show or just want to know where the next event will take place, join our mailing list! Our records are a little spotty, but this year we seated roughly 975 players in 198 games with a staff of more than 58 volunteers, including several who stepped in to help run games during the show. Thanks again for being part of this great year! Read on for a full list of the games played by frequency. 82+ Individual Game Titles, Including Tabletop and Larp! « See You This Week at Gen Con 2018!